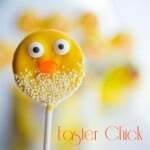 These Easter Oreo Chick Pops are adorable and would make a fun place setting on your Easter table. The kids will really love them too! I’m so happy it’s finally Spring and Easter is almost here. 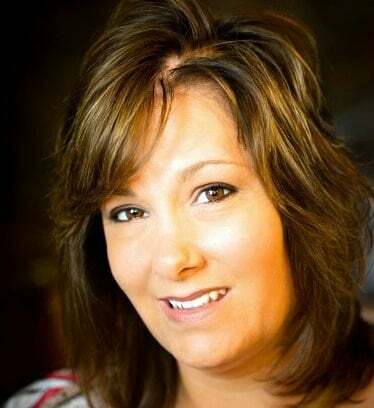 It allows me to find fun new recipes to experiment with and share with you. I mean just look at how ADORABLE these Easter Chick Oreo Pops are! 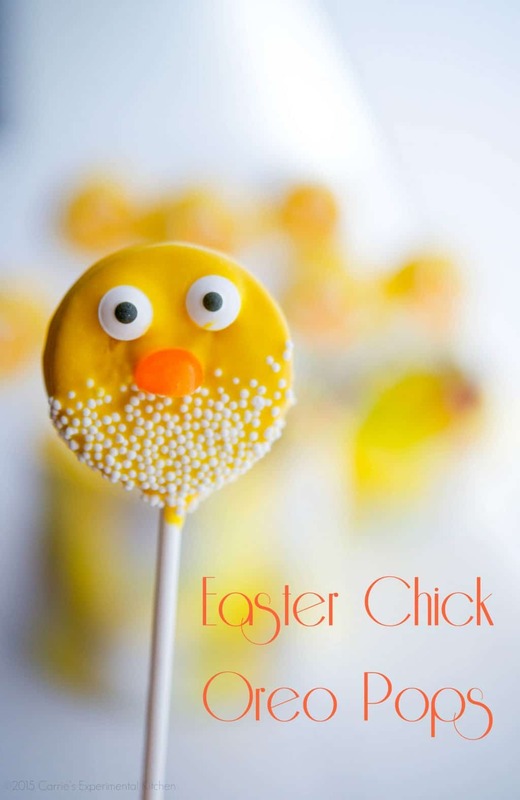 I was reading the most recent Family Circle Magazine and saw this recipe for Pop Chicks and just had to make them. Now…my kids are 18 and 13, but that doesn’t stop them from being a little kid at heart; especially at Easter. They STILL insist on making the Carrot Cake Easter Bunny Cake every year too! These pops were fun to make and I made them with two varieties of Oreo cookies: Double Stuff Golden Oreo’s and Lemon Oreos, since my youngest is a lemon fiend like her mother. 😉 These Easter Chick Oreo Pops didn’t take much time at all and they would make a fun treat on Easter or just to celebrate Spring in general. Start out by melting some yellow candy melts, then dip the stick into the chocolate and insert into the filling of the cookie and refrigerate a few minutes until the chocolate hardens. Next, dip the entire cookie in the melted chocolate; then decorate with nonpareils (for the egg shell), candy eyes and orange jelly beans for the nose; then refrigerate until everything sets. 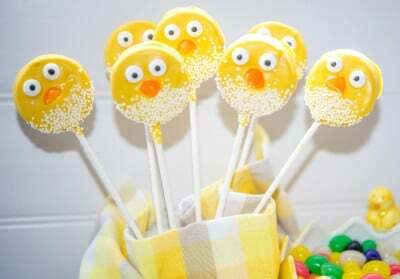 These Easter Oreo Chick Pops would make a fun place setting on your Easter table by sticking the pop into a small piece of styrofoam at each place setting; placed in a larger piece of styrofoam surrounded by jelly beans served on a large platter for dessert or even wrapped in groups of 2 or 3 in cello bags with ribbon to hand out to your guests. The kids (and adults!) will go nuts! Hey, if I can make these, you can too. ~Enjoy! 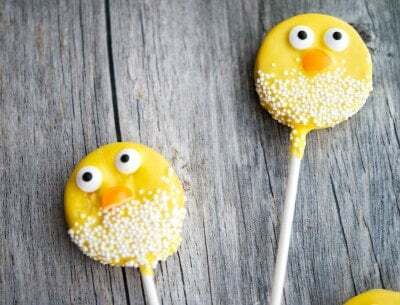 These Easter Oreo Chick Pops would make a fun place setting on your Easter table by sticking the pop into a piece of styrofoam at each place setting or in a larger piece of styrofoam surrounded by jelly beans served on a large platter for dessert. Place cookies on a baking sheet. Combine the candy melts and oil in a microwave safe bowl and microwave in 20 second increments until melted; stirring in between until smooth. Dip a lollipop stick into the chocolate and insert into the cookie filling; then refrigerate for about 3-5 minutes until the chocolate hardens. Cut the jelly beans into quarters carefully for the beaks and get a bowl to sprinkle the nonpareils over. Reheat the chocolate in 15 second increments if needed to thin out; then dip a cookie into the chocolate, scraping of the chocolate on the back side to avoid dripping. Add eyes and jelly bean beak, then sprinkle some nonpareils on the bottom to create the shell look. Refrigerate until chocolate and decorations set; about 5-10 minutes. I kept mine refrigerated until read to serve. Oh these are just so darn cute!! I love how bright they are!! I love doing fun things with Oreos. This is such a cute idea! Thank you Laura. When I saw them in the Family Circle Magazine I just had to make them they were so cute! These are adorable! My little ones will just love these! Now I have to go check out that Carrot Cake! Thanks Gwen, I’m sure they will! My youngest is 13 and she couldn’t stop eating them. The only good thing is she’s old enough to make them herself next time. 🙂 The Carrot Cake is fun too and the kids still like decorating it every year. It was originally made with vanilla cake and frosting; then covered in coconut for the fur, but no one is a big fan of coconut in my house so I updated it a few years ago to the carrot cake version. Enjoy! I love these Easter chick Oreo pops. They are perfect for Easter.